Ever wonder what pork would taste like if pigs subsisted on hot peppers? Keep wondering. But if its tasty spice you covet, youre in luck. 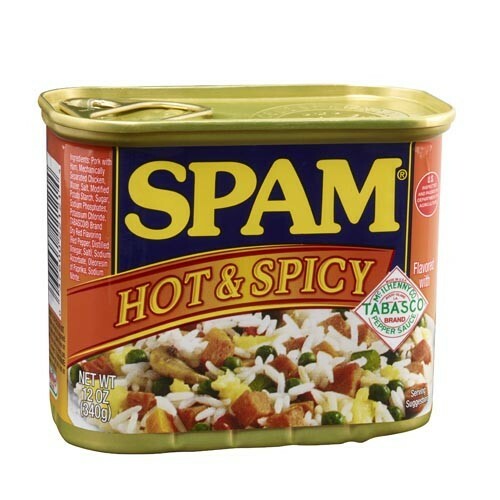 SPAM® Hot & Spicy turns up the heat on the flavor you already love. In fact, nine out of ten eskimos highly recommend it. 12 OZ CAN *ADDITIONAL SHIPPING CHARGES WILL BE ADDED ON ANY FLAVOR. **CANNOT SHIP THIS PRODUCT OUTSIDE OF THE UNITED STATES.